Now that the frame is finished, it’s time to move onto the gantry system. Although they look very similar on paper, there are is one key advantage to the FabTotum system: no belt cross-over. This may seem purely cosmetic, but in fact it makes assembly and operation much easier simply because you are able to avoid any friction from the belts rubbing together at the cross-over. I decided to use large 57 tooth, 35mm diameter pulleys to help increase the accuracy of the printer. However, this comes at the cost of reduced torque due to the larger diameter. I hope to mitigate this torque loss by using high torque NEMA 23 motors in the final printer. 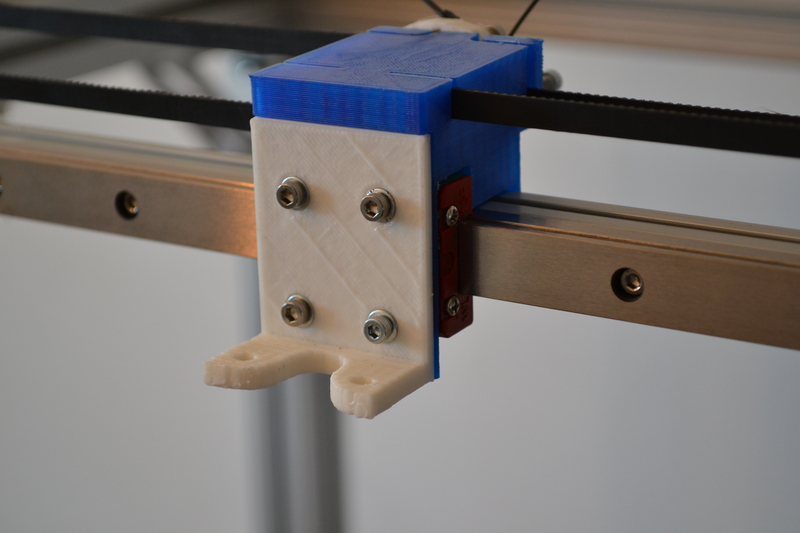 Currently I am using printed parts for the x carriage, y carraiges, hotend mount, and idlers. I am designing each printed part so that it can be made out of stock metal parts or machined at a later date. Is there any disadvantage if the red and blue belts would not cross at the ends of the Y-gantry, i.e. to make the red belt the upper one and the blue belt the lower one on the left side of the y-gantry and ofcourse the opposite on the right side of the y-gantry ? This might further simplify the layout and even save a minor amount of beltlength. 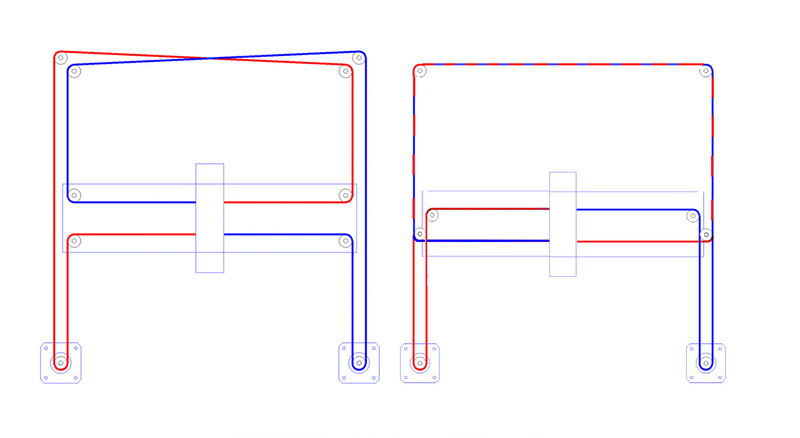 Offsetting the belts is exactly what the configuration on the right does (red on top, blue on bottom, or vis-versa). The only disadvantage (and I wouldn’t even call it that…) is that since the attachment points for the belts are not along the same plane on the x-carriage, there is a very tiny moment of rotation that is centered around the center of the carriage. However, because it is so small, it is basically 0. Hi! I’m really intressted in this design, although i don’t get why the belt have to cross on the x-axis? Am i missing something? Hopefully you get what i’m trying to explain. Nope, you’re not missing anything. The belts in a regular CoreXY format (left side of the first image) do cross, but they can also be ran at 2 different heights. This makes the belt routing a little more straight-forward. 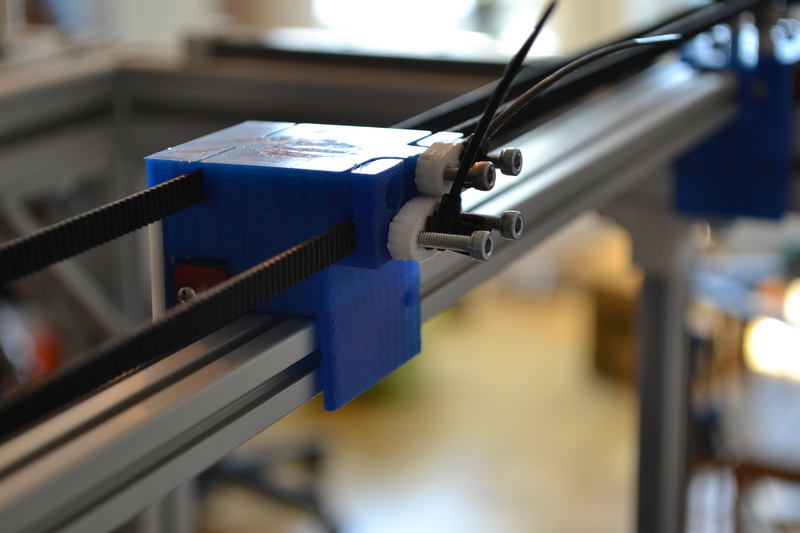 The main reason they cross in the left design, is because at the hotend carriage each end of the belt is mounted along the same plane. In the other design the belts mount and run along 2 separate planes (thus avoiding the cross-over). Honestly though, I’ve seen both work perfectly fine. It really comes down to personal preference.